ProCredit Bank is realizing a new credit line within the program of support to small enterprises in procuring equipment, within which the state is supposed to support local business with grants in the amount of as much as RSD 1 billion. All ProCredit Bank branches have started accepting requests by local businesses for affordable investment credits along with grants from the Ministry of Economy of 25% of the value of the planned investments. As in the past years, under the program, small enterprises should provide at least 5% of the funds for the planned procurement of production equipment, while getting 25% as a grant from the state budget. The remaining 70% is financed through affordable credits of ProCredit Bank. The funds provided within the program are to be used exclusively for investments in the procurement of new production equipment and machines, the purchase of transporting devices included in the production, as well as for investments in the procurement of new parts, special machine tools and other capital goods. 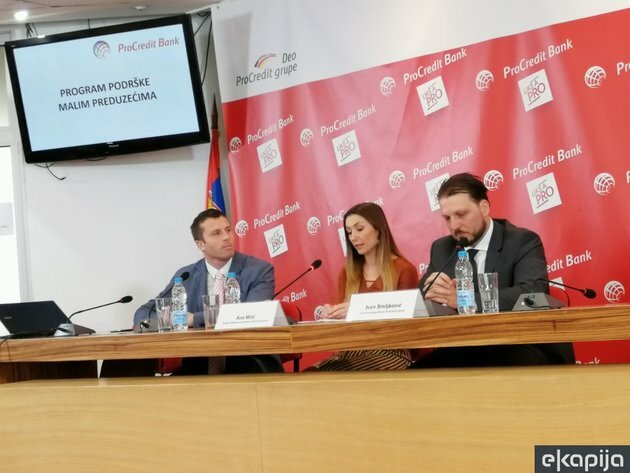 ProCredit Bank has been chosen as one of the five partners of the Ministry of Economy this year, as it offered very favorable conditions for all companies in Serbia interested in state grants at the contest organized by the competent ministry. – The amount set aside by the state is nearly twice as high as the last year's – Ivan Smiljkovic, a member of the Executive Board of ProCredit Bank, pointed out at today's press conference. In addition to the very favorable interest rate, a special feature of this program is also the security that businesses will need if they get a favorable loan from ProCredit Bank. – Under this program, the security instrument can be the object of the procurement itself, which will enable many small businesses to modernize their production under much simpler conditions – pointed out Ana Milic, the head of the Economy Sector at ProCredit Bank. The loans are to be approved for a period of 18 to 60 months, with a 6-month grace period.